Brakes are one of the most important components of any vehicle. One must always ensure that it is in perfect working condition. This is important for the safety of the driver, vehicle, passengers and other people on the road. Whenever you find that your brakes are giving you trouble, you should get in touch with a reliable service provider for auto brake repair in Parkland, WA. To know about the best place to get brakes done, we recommend thorough research. You are going to come across Lakewood Auto Body in this research. We offer auto brake repair services around Parkland and we have been around since 1962. We've come a long way with our brake repair shop. You will likely find us when you search for brake repair shops near me. We have an established brake repair shop in the Parkland community that can resolve all the issues with the brakes of your car. Have faith in our services and you will never be disappointed. Visit our brake repair shop if you want your car to function in the most efficient way possible. What to expect when you visit our shop? With us as your auto brake repair service provider, you don't need to worry about anything regarding your car. You only see our skills and diligence at work when we perform auto brake repair in our Parkland shop. We really appreciate the trust you show in us when we repair your car's brakes. Thus, we find it our moral and social obligation to fix the issue in the most efficient manner, as the safety of a lot of people is at stake! Looking for the cheapest places to get brakes done? Get in touch with us! For any information regarding our auto brake repair services, we are just a phone call away. 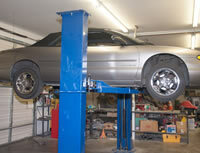 Reach locally owned and operated Lakewood Auto Body at (253) 581-0220 for auto brake repair near Parkland. Visit our brake repair shop today!